For Friday, I generally like to feature a picture relating to Christ’s Passion. So… here is a picture of the Nativity! Nativity of Christ, by Lorenzo Lotto, c. 1523. National Gallery of Art, Washington, D.C., United States. On the surface, of this picture, it looks like a typical Nativity scene. 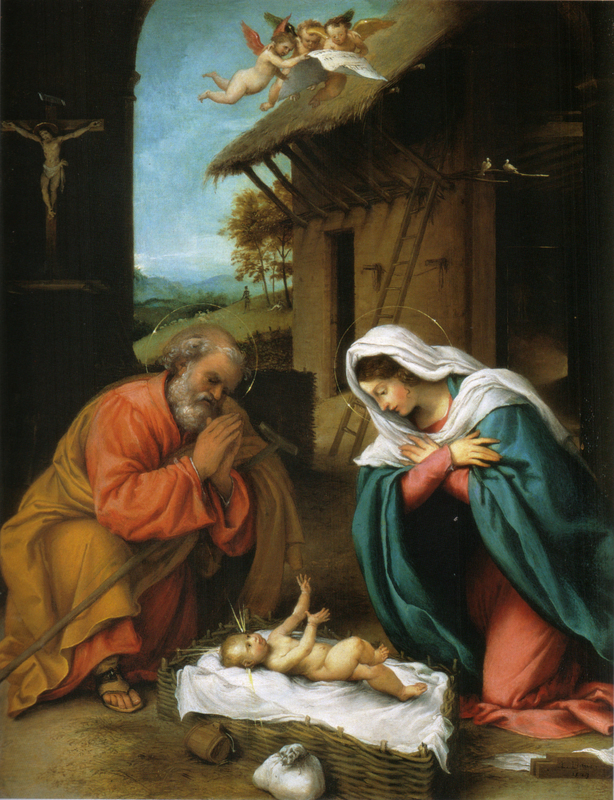 Both Mary and Joseph look adoringly at Jesus, who lays before them as a mere infant. In fact, I have a calendar that features this (cropped!) image showing just them for the month of December! There are other lovely reminders of Christmas! A trio of angels flies overhead, carrying a message or perhaps a song of praise. A shepherd gathering sheep is in the fields, presumably coming to visit them. Overhead, there are two turtledoves looking down at them, reminding us of another Joyful Mystery — the Presentation of the Lord, in which Mary and Joseph bring the infant Christ to the Temple and present Him to the Lord. Yet, in the background in this idyllic scene of family and adoration, an ominous reminder of the future looms in the background: the cross. Honestly, when I first looked at this at this artwork, I didn’t even notice the crucifix for the longest time. Why? Because in our Christian lives, the crucifix is an ubiquitous item that can seem so normal to us that we forget how shocking that image is. Of course there’s a crucifix! Of course Jesus hangs off of it! I have a crucifix hanging in my living room — is it not a normal feature in domestic life? So, I didn’t think twice when I saw the two parents look adoringly at their infant with the image of the crucifix hanging behind them. Except it isn’t. Not then. Not when Christ was only a mere infant. It seems almost horrific to think of Him being crucified in such an intimate scene in which Christ . Yet, even as an infant, Christ was visited and hailed as a king, though it wasn’t very clear how exactly He was supposed to be a king. And, just when He was about to die, He was finally crowned — with a crown of thorns — and lifted high above — on a cross. And now He is the King of Heaven. So, even as we celebrate Christmas, we also acknowledge Christ as King — not just as a innocent babe, but also as Christ crucified. And we ask that He renew us and give us the strength for the new year to carry our own crosses and follow Him. What was the first thing that drew you in when you looked at this picture? Did you notice the crucifix right away, or did you not even see it when you looked at the picture? What do you think of when you envision Christ the King? Thank You for coming into this world as a man to save us from our sins. Help us carry our crosses and follow you. This is one of the featured images in my new book, The Joyful Mysteries, which illustrates every prayer of the Joyful Mysteries with classic religious art. Take a peek at it here!